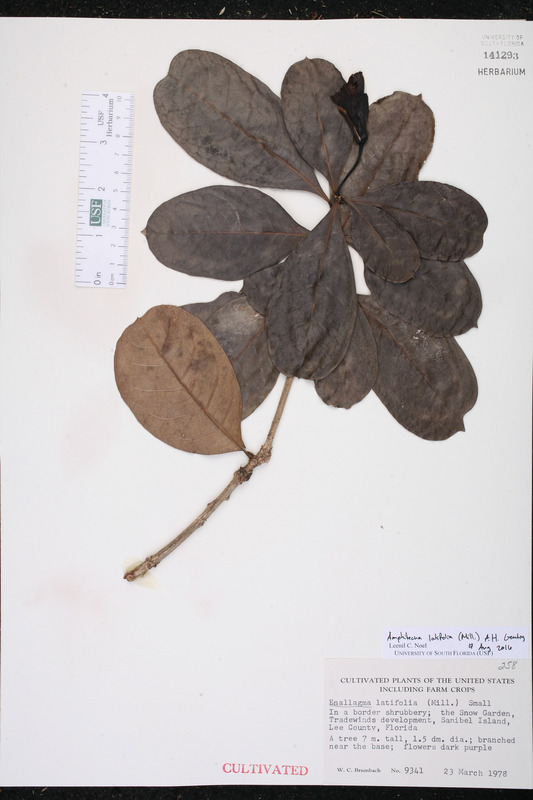 Citation AMPHITECNA LATIFOLIA (Miller) A. H. Gentry, Taxon 25: 108. 1976. Basionym: Crescentia latifolia Miller 1768. Type: Without data (lectotype: Plumier, Pl. Amer. pl. 109. 1757). Lectotypified by A. H. Gentry, Taxon 22: 638. 1973. Crescentia cucurbitina Crescentia cucurbitina Linnaeus, Mant. Pl. 250. 1771, nom. illegit. BASIONYM: Crescentia latifolia Miller 1768. Crescentia latifolia Crescentia latifolia Miller, Gard. Dict., ed. 8. 1768. TYPE: Without data (lectotype: Plumier, Pl. Amer. pl. 109. 1757). Lectotypified by A. H. Gentry, Taxon 22: 638. 1973. 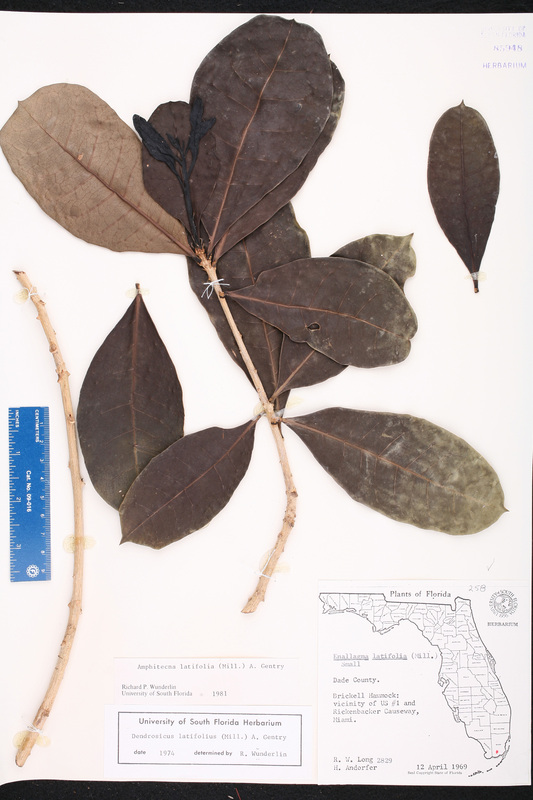 Dendrosicus latifolius Dendrosicus latifolius (Miller) A. H. Gentry, Taxon 22: 638. 1973. BASIONYM: Crescentia latifolia Miller 1768. Dendrosicus saxatilis Dendrosicus saxatilis Rafinesque, Sylva Tellur. 80. 1838, nom. illegit. BASIONYM: Crescentia latifolia Miller 1768. Enallagma cucurbitina Enallagma cucurbitina Baillon ex K. Schumann, in Engler & Prantl, Nat. Pflanzenfam. 4(3b): 247. 1894, nom. illegit. BASIONYM: Crescentia cucurbitina Linnaeus 1771, nom. illegit. ; Crescentia latifolia Miller 1768. Enallagma latifolia Enallagma latifolia (Miller) Small, Fl. Miami 171, 200. 1913. 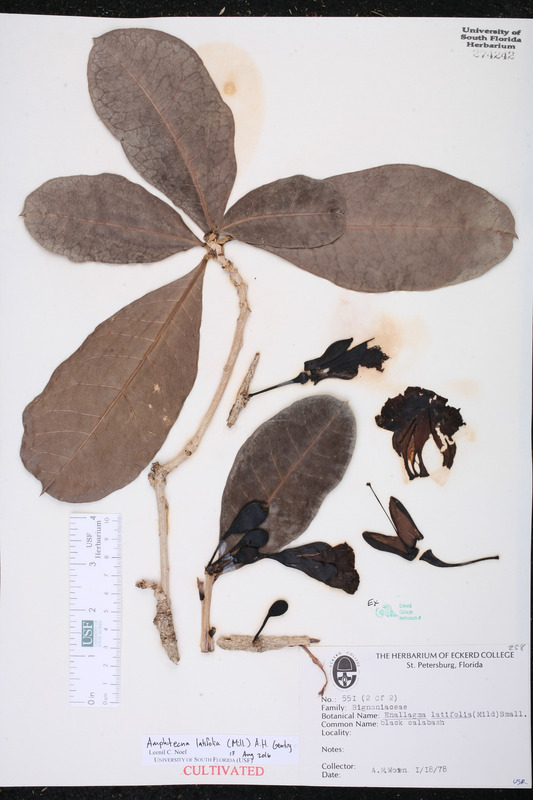 BASIONYM: Crescentia latifolia Miller 1768. 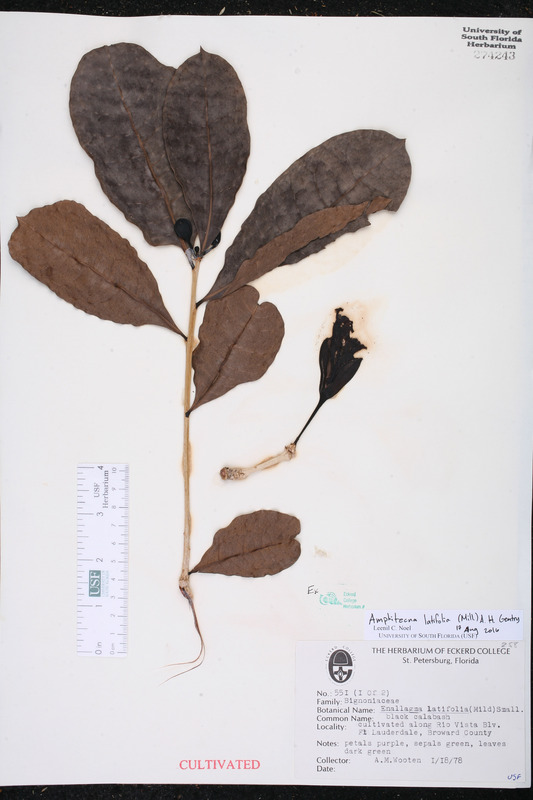 Amphitecna obovata Amphitecna obovata (Bentham) L. O. Williams, Fieldiana, Bot. 36: 25. 1973. BASIONYM: Crescentia obovata Bentham 1844. Crescentia cuspidata Crescentia cuspidata Miers, Trans. Linn. Soc. London 26: 178. 1870. TYPE: VENEZUELA: Without data, Fendler 780 (lectotype: K; isolectotype: GH). Lectotypified by A. H. Gentry, Fl. Neotrop. 25(1): 66. 1980. Crescentia elongata Crescentia elongata Miers, Trans. Linn. Soc. London 26: 178. 1870. TYPE: CUBA: Without data, Wright 361 (holotype: K; isotypes: GH, MO). Crescentia lethifera Crescentia lethifera Tussac, Fl. Antill. 4: 50. 1827. 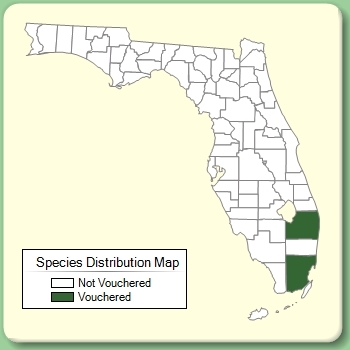 TYPE: Without data (lectotype: Tussac, Fl. Antill. 4: pl. 17. 1827). Lectotypified by A. H. Gentry, Fl. Neotrop. 25(1): 66. 1980. Crescentia obovata Crescentia obovata Bentham, Bot. Voy. Sulphur 130, t. 46. 1844. 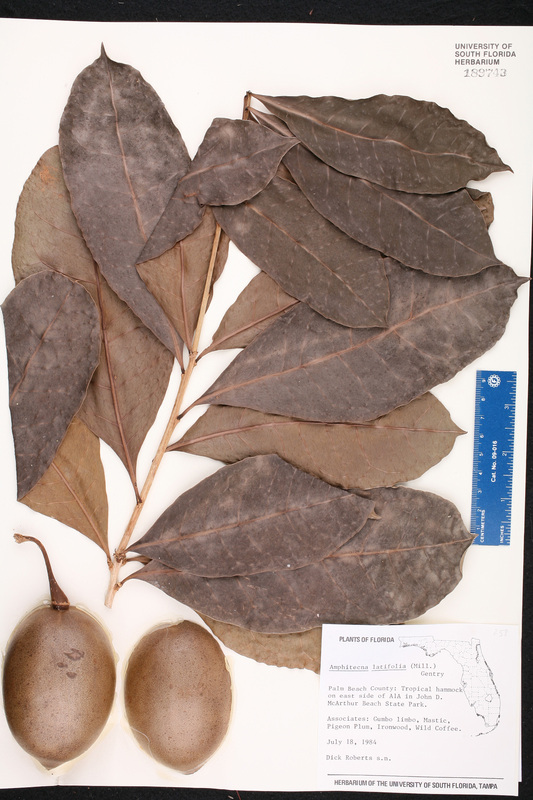 TYPE: COLOMBIA: Cauca: Isla Gorgona, s.d., Barclay 935 (lectotype: K; isolectotype: BM). Lectotypified by A. H. Gentry, Fl. Neotrop. 25(1): 66. 1980. Crescentia toxicaria Crescentia toxicaria Tussac, Fl. Antill. 4: 50, pl. 17. 1827, nom. illegit. BASIONYM: Crescentia lethifera Tussac 1827. Enallagma obovata Enallagma obovata (Bentham) Baillon ex K. Schumann, in Engler & Prantl, Nat. Pflanzenfam. 4(3b): 247. 1894. BASIONYM: Crescentia obovata Bentham 1844. USA Florida Palm Beach Co. 18 Jul 1984 D. Roberts s.n. USA Florida Lee Co. 23 Mar 1978 W. C. Brumbach 9341 CULTIVATED. USA Florida Broward Co. 18 Jan 1978 A. M. Wooten 551 CULTIVATED. Sheet 1 of 2. USA Florida Broward Co. 18 Jan 1978 A. M. Wooten 551 CULTIVATED. Sheet 2 of 2.